Some parts of this video may have changed slightly since it was first recorded. Please see the instructions below for the latest usage. Most notably, you will need to install the Array Toolkit, not the Okay Toolkit. Slate uses a few plugins to provide extra functionality to the theme. Once activated you will see the Portfolio Items menu on the WordPress admin menu and find new widgets on the Widgets page. There are no settings for the Array Toolkit, features are activated automagically based on what your theme supports. Contact Form 7 – This plugin creates a fully functional contact form for your site. 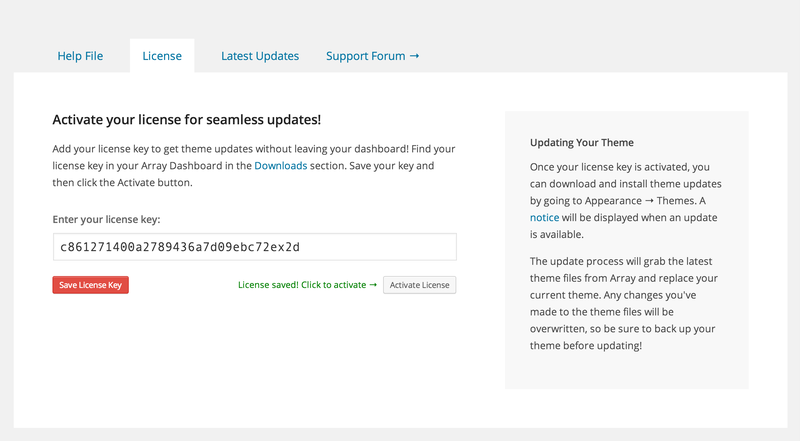 You can install it directly from your dashboard in the Plugins menu, or grab it from the WordPress.org plugin repository. Type “Contact Form 7” into the Search input and click the “Search Plugins” button. Locate Contact Form 7 in the list of search results and click “Install Now”. There will now be a Contact menu on the WordPress admin menu. See below for more instructions on using this plugin with the theme. Slate is customizable via the WordPress customizer, where you can change Slate’s various settings. Slate Style Settings – Upload your logo, change your color scheme and accent colors, and add custom CSS. Slate Header Settings – Set your homepage header title, subtitle and hidden header toggle text. Slate Homepage Settings – Enable or disable any of the homepage sections and add titles for each section. Slate Portfolio Settings – Add an intro title to the top of your Portfolio page. Slate’s homepage is comprised of several different features of Slate, and requires a little setup to look like the demo. If you haven’t already, create a new page called Home. You don’t need to add any content to this page, the various sections will be automatically brought into the Homepage template. In the right hand sidebar, in the Page Attributes section you’ll see the Template settings. From the Template dropdown, select the Homepage. This will apply the unique homepage layout to this page. Publish your page when you’re done. Finally, we need to tell WordPress to use this page as the homepage. Go to Settings → Reading. In the Front page displays section, select A static page. Then, set your Home page (created above) as the Front page and your Blog page as the Posts page. Save changes when finished. The Homepage settings are in Appearance → Customize and will be explained further below. You will populate the homepage with Slider Items, Portfolio Items, Blog posts, and optional text widgets in the services section, all detailed below. Once you’ve installed the Array Toolkit, you’ll notice you now have a Slider Items menu in your admin menu. This is where you’ll create your slides. Make sure you have the Slider section enabled in Appearance → Customize → Slate Homepage Settings. Click Slider Items → Add New in the WordPress admin menu. Add a slide title, which won’t be outputted anywhere so you can title it anything. On the right hand side of your page, you’ll see the Featured Image pane. Click Set Featured Image and upload the image you’d like to be in the slider. Each slide requires a Featured Image. Once uploaded, scroll down and click Use as featured image. Once set, you can close the image upload window. Scroll down to the Slide Link meta box and add a link for your slide. This can be a link to another page on the site or an external link. Once finished, publish the slide and check it out on your homepage. 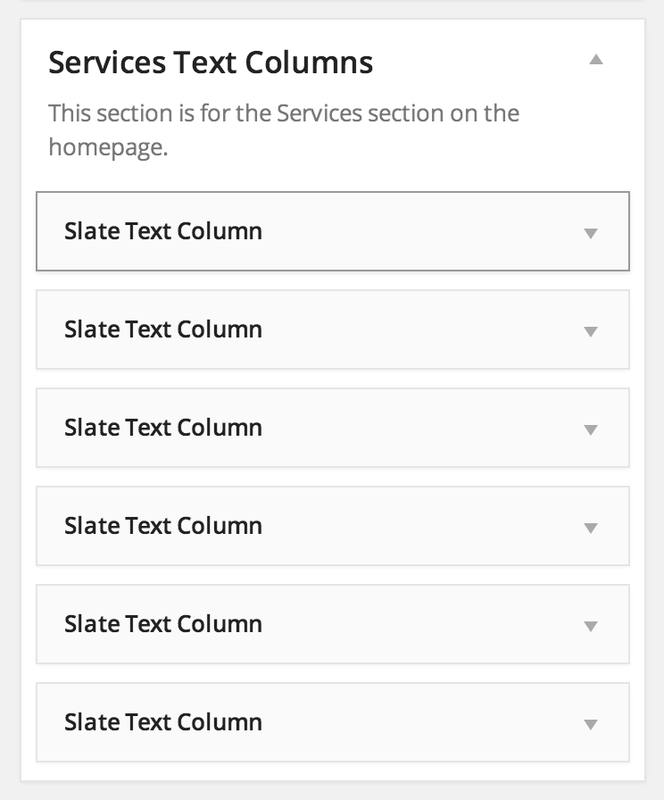 Using the Slate Text Column widget, you can add blocks of text to the Homepage to act as a services section. Make sure you have the the Services section enabled in Appearance → Customize → Slate Homepage Settings. Visit Appearance → Widgets and locate the Slate Text Column widget in your list of available widgets, and drag it to the Services Text Columns widget area. Add a title for your text column, a URL to link to (optional), and the content you’d like below your title. You may also choose an icon to represent your text block. To choose an icon, head to the FontAwesome site and take a look at the available icons. When you find one you like, copy the name of it (i.e. fa-check or fa-plus) and paste it into the Column Icon field in the widget. When complete, your widget should resemble this sample widget. Portfolio Items are automatically added to the Homepage, as long as you have the Portfolio section enabled in Appearance → Customize → Slate Homepage Settings. See the Adding Portfolio Items section below to get started creating your Portfolio Items. Blog posts are automatically added to the Homepage, as long as you have the Blog section enabled in Appearance → Customize → Slate Homepage Settings. To activate the Portfolio Items section of the theme, you need to first install the Array Toolkit plugin as outlined above. The plugin will provide the theme with the Portfolio post type, which populates the Portfolio page. The Blog page needs to be assigned to as the Posts page of your blog. If you haven’t already, create a new page called Blog. You don’t need to add any content to this page since this page will just bring in your blog posts. Publish your page when you’re done. Finally, we need to tell WordPress to use this page as the Posts page. Go to Settings → Reading. In the Front page displays section, select A static page. Then, set your Blog page (created above) as the posts page and your Homepage page as the Front page. Save changes when finished. The rest of the Blog settings are in Appearance → Customize and will be explained further below. 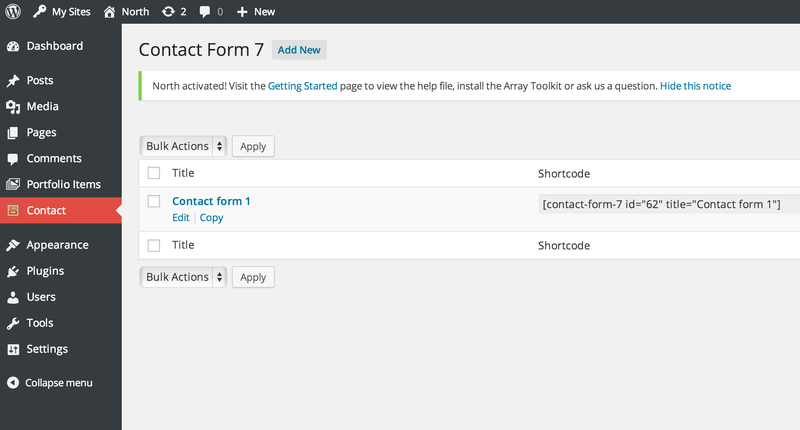 The Contact Page uses the Contact Form 7 plugin, which can grab for free on the WordPress plugin repository. See installation instructions above. Once installed, you’ll see there is a Contact link in the left hand sidebar of your WordPress admin. Go to the Contact menu on the left admin menu to configure your contact form. By default they give you a simple form with Name, Email, Subject and Message. To keep things simple, I suggest using the default form. Otherwise, to customize this form even further, check out the Contact Form 7 docs page here. After you’ve configured and saved your contact form in the Contact menu, you will be given a small shortcode like this: [[contact-form 1 “Contact form 1”]]. Copy your shortcode. We’ll use this to add the form to our Contact page. Now head back to your Contact page. Paste the Contact 7 shortcode that you copied into the body of the post. Update the post. You should now see the form on the contact page. Along with the title of any post or page, you can also set a subtitle, just like you see throughout the demo. To add a subtitle, simply add text to the Subtitle meta box on any post or page edit screen. See an example. You’ll want to create at least one menu for the header navigation. Slate utilizes several widgetized areas. Make sure you have the Array Toolkit plugin installed to get all the widgets you see below. Header Toggle Icons – This widget area uses the Array Social Media Icons Widget to add various links to your social sites. Simple add the widget to this section and fill out your links. See an example. Sidebar – You can put whatever you want in the sidebar! On the demo site, I used the Array Recent Posts Widget, the Slate Sidebar Portfolio Widget and a search field. Footer Widget Section – There is also a Footer Widget section which fits 3 widgets across the bottom of your site. 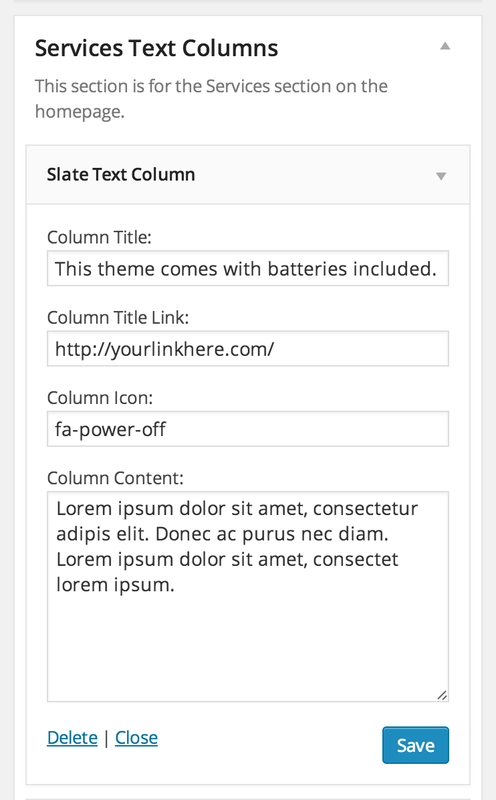 Slate comes with a few custom element styles, which are used to easily add extra styling to your WordPress posts. To use the post styles, simply select your text and then select from the drop down which style you would like to apply. You’ll be able to see the changes live, in your editor. Highlight – This will highlight text with a yellow background. Intro Title – As seen on the demo, this is a nicely styled block of text to introduce your page or post.